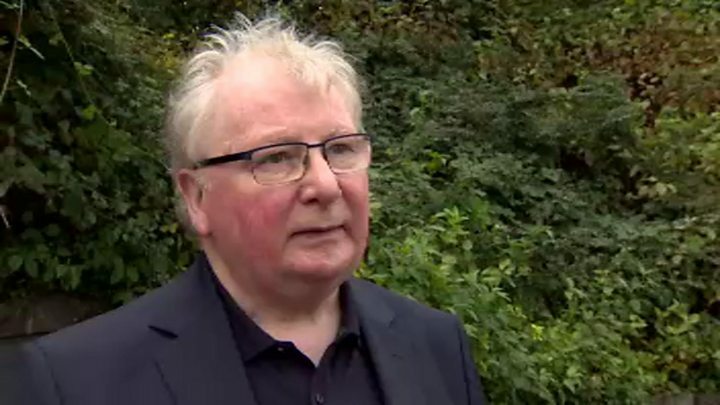 Protests against Brexit took place in a number of areas along the border between Northern Ireland and the Republic on Saturday. The demonstrations were organised by campaign group Border Communities against Brexit. Protesters maintain that Northern Ireland's referendum result - in which a majority voted to remain in the EU - should be respected. They are also opposed to any strengthening of border controls. Its members said their voices must be heard when decisions are taken. "I have friends and relations within a three mile radius, either side of the border, but mostly [affected is] my livelihood and my husband's livelihood," said one. 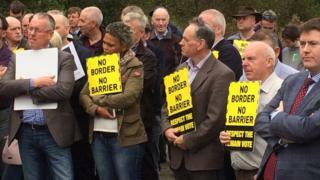 Over 100 people attended the protest at the Fermanagh-Leitrim border between Belcoo and Blacklion. Protests were also held at Carrickcarnan on the Louth-Armagh border, at Moybridge between Tyrone and Monaghan, Aghalane Bridge between Fermanagh and Cavan, Lifford Bridge between Tyrone and Donegal and at Bridgend on the border between Londonderry and Donegal. Politicians from a number of political parties were present, including Sinn Féin, the SDLP and Fianna Fáil.